When the curtains open after our winter clean this year, we’ll be looking out at the garden in all its summer glory. We will be reopening at the end of June 2015 with an outdoor theatre performance of Shaw’s scandalous play Mrs Warren’s Profession. We’re going to be staying closed for longer than usual as the house needs essential repairs to the electrics. This work is extensive and means that the house will remain closed while the work takes place. While we’re closed, why not get in touch about volunteering with us? Don’t forget also to book your tickets for Mrs Warren’s Profession 27- 29 June and the riotous John Bull’s Other Island 26 – 28 July. We’ll be posting lots of behind-the-scenes pictures and information here as the work progresses, as well as more electrifying (sorry – just couldn’t resist) untold stories from the life of George Bernard Shaw! If you happen to be passing during this time, you will be able to have a look around the garden, see the Writing Hut and take something away from our shop. 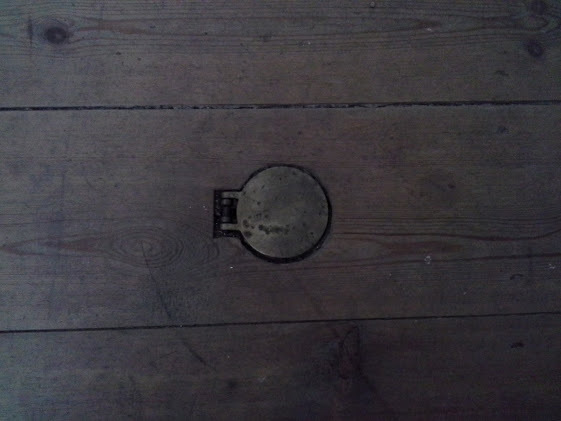 This plug socket in the Dining Room allowed the Shaws to light their dinners with converted Georgian silver candlesticks! This entry was posted in News and tagged Ayot St Lawrence, National Trust, News, Shaw's Corner, Visitors. Bookmark the permalink. I have been a great fan on Shaw for more than a half century. Please tell me I can visit Shaw’s Corner when I make a pilgrimage to England (from California) the last week of June. P.S. I have a significant collection of Shaw biographies that I will want to find an appreciative home. We look forward to welcoming you to Shaw’s Corner! Unfortunately, our electrical rewiring work has overrun, and the house now won’t be opening at the end of June. However we will have our glorious outdoor theatre production of “Mrs Warren’s Profession” 26 – 28 June, performed in the gardens, with a dress rehearsal on 25th June. Shaw biographies will definitely find an appreciative home here!